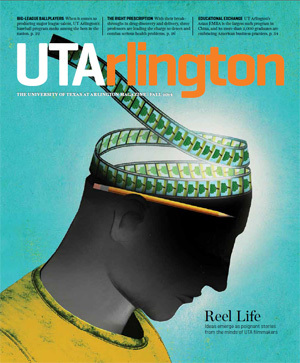 UTArlington Magazine is published three times a year by University Communications for all alumni, as well as for faculty, staff, and friends of the University. Reproduction in whole or in part without written permission is prohibited. The comments and opinions expressed in this magazine do not necessarily represent those of The University of Texas at Arlington or the staff of UTArlington Magazine. Copyright © 2014, The University of Texas at Arlington. An equal opportunity/affirmative action employer.